Byrd, the son of former NFL cornerback Gill Byrd, was a first-team All-Pac 10 selection in 2008 and Defensive MVP of Oregon’s Holiday Bowl win over Oklahoma State. Overall, he intercepted 17 passes in college and opted to forego his final year of eligibility to enter the ’09 NFL draft. 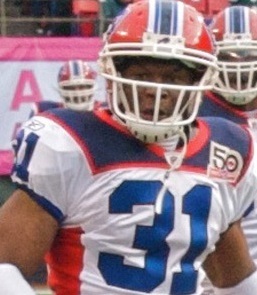 Byrd was chosen by the Bills in the second round and exceeded expectations, moving into the starting lineup at free safety. What he lacked in speed he made up for with good overall skills and keen instincts. Bills went 6-10 to finish fourth in the AFC East while leading the conference in interceptions (28). Having performed well as a rookie, Byrd had problems with consistency in 2010 and, together with the team playing poorly against the run, intercepted just one pass. His play improved in 2011 and he was credited with 75 tackles in addition to three interceptions, and in 2012 he topped the AFC with five interceptions and returned to the Pro Bowl for the first of two straight years. Byrd also received first-team All-NFL honors from Pro Football Focus in 2012 and second-team recognition from the Associated Press after both 2012 and ‘13. Having intercepted 22 passes with Buffalo, he moved on to the New Orleans Saints as a free agent in 2014 where he missed all but four games with a knee injury. Through 2015, Byrd has accumulated 23 interceptions, two of which were returned for touchdowns, and six fumble recoveries along with over 300 tackles. He has received at least some first-team All-NFL recognition once, second-team honors after three other seasons, and been chosen to three Pro Bowls.